Pours a bright golden yellow color. Aromas of malts, yeast, and a little fruit. Has a light fruit taste, with some yeasty notes, a touch of orange, and a good hop flavor. 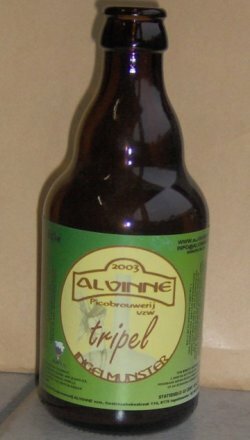 One of the original Alvinne beers, precursor to Morpheus Tripel, not sure if this original version is still made now. Tasted some years ago, this was a hazy peach blonde beer with creamy, off-white head and fruity and bready character with floral hops and some spiciness as well as a hint of ’jenever’ but not disturbingly so. This was a good tripel indeed, too bad I never got (or took) the chance to compare it side by side with the Morpheus version. Backlog. Bottle, 8.7%. Gushing. Cloudy orange color. Big dense head. Aroma’s: hoppy, herbal, refreshing. Retronasal there’s candy sugar, light fruit, citrus, light herbs (vanilla?). Flavor is light sweet and light acidic (due to high CO2?). Medium bodied. Long finish, but hardly bitter. Interesting triple. Bottle @ home. A bit hazy orange to amber color. Smell malts spices some sweetness and yeast. Taste malts spices yeast and some herbs. Not bad but certainly not good either. A bit weird. Medium carbonation, medium body. 330ml bottle, vintage 2007, 8.7% abv., bb. Nov. 2011 bought at The Bottle Shop in Brugge. Served comfortably chilled in a tulip glass at home. Big, airy white head, slowly dissipating. Cloudy, orange-grey body. Good lacing to the glassware. Sweet spiced orange fruits to the nose. Lemon and orange taste with underlying hints of spices. Half-dry, bittersweet ending. Foamy in the mouth. Mostly covered alcohol. Refreshing and pleasurable (Tromsø, 27.08.2011). Bottled, 330ml from Hopduvel Warehouse, Ghent. Bronze amber wuth white head. Really spicy aroma with a volcanic opening of the bottle, loads of condition. Spicy flavours right from the start with a candied yeasty hint, some sweetness but not overly. A big, bold tripel, plenty of depth, really pretty decent. Bottle 330ml. Color hazy dark orange with big head. Aroma sweet, vanilla, fruits, melon. Taste orange, sweet, vanilla, spicy. Bottle. Amber, cloudy, large and mostly lasting. Moderate malty and sweetish aroma with fruitiness, light vanilla and citrus. Body is medium, malty and sweetish flavor, some caramel with light fruitiness and alcohol. Finish is average, malty and lightly sweet with alcohol and light spiciness. Nice tripel, quite sweet though – not overly spiced. [330ml bottle from Beers of Europe at 8.7% ABV] My first beer from a "picobrewery", although given that it’s distributing to England it’s probably not as "pico" as it proclaims itself to be. Orangey-gold, slight white head, moderate fizz. Aroma of chardonnay and banana. Big hit of ginger on the first taste which fades to give… yep, more chardonnay. There’s some welcome bursts of juicy oranges, a slight dryness, some bread, and a slight but lasting mineral bitterness in the finish. Overwhelming impression is of a lightly hopped white wine! Disconcerting, and although it grew on me a little I couldn’t decide if I liked it or not. On balance, probably not.